For the replica temple in Hawaii, see Byodo-In Temple. Built in 998 in the Heian period, Byōdō-in (平等院) is a temple in the city of Uji in Kyoto Prefecture in Japan. The most famous building in the temple is the Phoenix Hall or the Amida Hall. It is a Buddhist temple, established by Fujiwara no Yorimichi in 1052: the former owner, Minamoto no Toru, used the building as a country villa. Additional buildings making up the compound were burnt down during a civil war in 1336. Byōdō-in consists of a central hall, flanked by twin wing corridors on both sides of the central hall, and a tail corridor. The central hall houses an image of Amida Buddha. The roof of the hall displays statues of fenghuang, the Chinese phoenix, called hōō in Japanese. The Phoenix Hall (鳳凰堂 hōō-dō), completed in 1053, is the exemplar of Fujiwara Amida halls. It consists of a main rectangular structure flanked by two L-shaped wing corridors and a tail corridor, set at the edge of a large artificial pond. Inside, a single golden image of Amida (c. 1053) is installed on a high platform. The Amida sculpture was executed by Jocho, who used a new canon of proportions and a new technique (yosegi), in which multiple pieces of wood are carved out like shells and joined from the inside. Applied to the walls of the hall are small relief carvings of celestials, the host believed to have accompanied Amida when he descended from the Western Paradise to gather the souls of believers at the moment of death and transport them in lotus blossoms to Paradise. Raigo paintings on the wooden doors of the Phoenix Hall, depicting the Descent of the Amida Buddha, are an early example of Yamato-e, Japanese-style painting, and contain representations of the scenery around Kyoto. There is a garden with a pond in front of the building, which in 1997 was dredged as part of an archeological dig. Japan commemorates its longevity and cultural significance by displaying its image on the 10 yen coin. 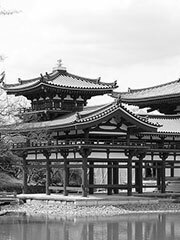 In December 1994, UNESCO listed the building as a World Heritage Site as part of the «Historic Monuments of Ancient Kyoto». The Phoenix Hall, the great statue of Amida inside it, and several other items at Byōdō-in are national treasures. A full-size replica of the temple was built in 1968 at the Valley of the Temples on O’ahu, Hawaii. See Byodo-In Temple.